Best Time to go to Fernando de Noronha, Brazil. So, you've been wondering what's the best time to visit the Island of Fernando de Noronha? Fernando do Noronha is located 200 miles off of the coat of Brazil. It was declared a UNESCO world Heritage site in 2002 and considered to have some of the most beautiful beaches in Brazil. The main island is the only inhabited island of the archipelago. Most travelers choose to visit the island from the middle of December through February. As only a limited number of visitors are allowed on the island at a time to maintain its natural integrity it is important to book well in advance. In addition plan your stay well as the longer you visit the island the more Environmental Preservation Tax you will have to pay. Smart travelers pack as much as they can into the shortest amount of time possible. The temperatures remain fairly consistent through the year at around 80 degrees F. Humidity is quite high and ranges from 75% to 85% year round. 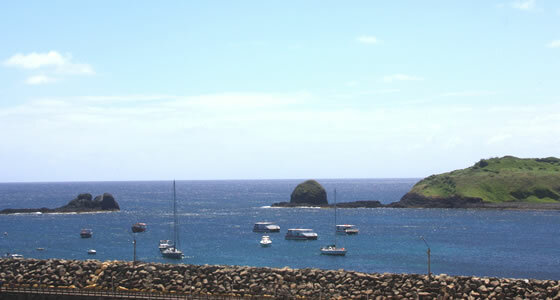 Fernando de Noronha has two basic seasons, wet and dry. The rainy season is from January to August and the dry period ranges from September through December. The most rain falls in March and April. Scuba divers will find the best conditions from August to November on the northern part of the island and from January to March on the southern coast. Surfing is at its best from December to the end of March.